Welcome to The Beer Mall- Great Deals on Beer, Beer Travel Gear & More! ﻿The beer mall is dedicated to bringing you deals, special offers and finds related to craft beer, beer travel gear, beer festivals and other beer event tickets and more! Check out the great deals on rare and delicious brews. While we are still under construction, we have a few great deals already listed below, so check them out! Meanwhile, stay tuned and check back frequently as we add new vendors. Please be advised that you must be 21 years of age or over in order to purchase beer. As a thank you and special gift for your support, Bon Beer Voyage is teaming up with Uber, so you can ride with ease on us! 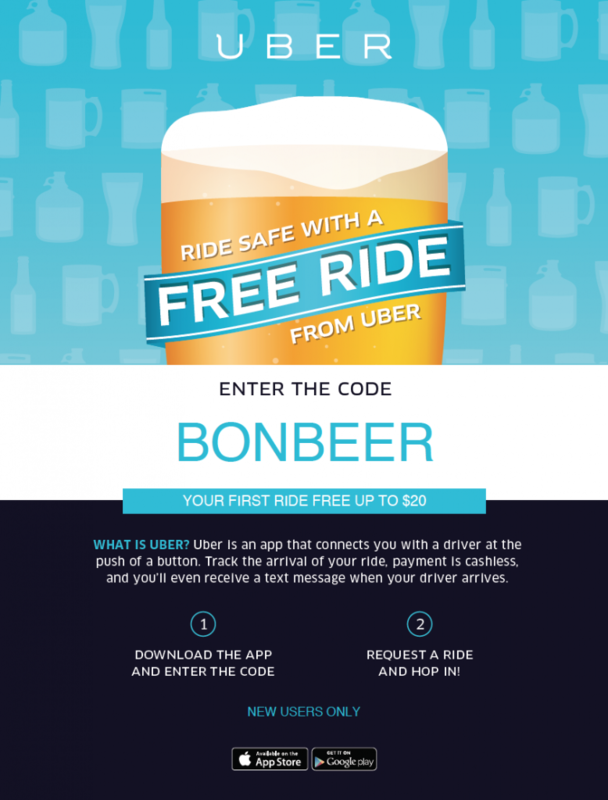 To get your first Uber ride free (up to $20), sign up at http://get.uber.com/go/bonbeer, or download the app, and enter the promo code BONBEER. Uber is an app that allows you to request a ride with the tap of a button. Drivers arrive curbside in just minutes, you can track the arrival of your ride on your phone, and payment is charged directly to your credit card on file. They have Black Cars, SUVs, and their low cost option, uberX is about 1/2 the price of a TAXI! Have your friends signup to use the Fare Split tool and make riding even more affordable!